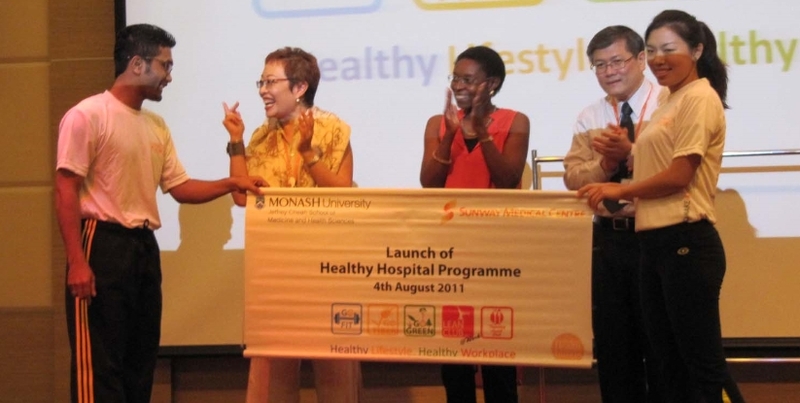 The Sunway Healthy Hospital Register (SHHR) is a partnership program between the Jeffrey Cheah School of Medicine and Health Sciences at Monash University Malaysia and the Clinical, Professional and Support Services of the Sunway Medical Centre. The SHHR program facilitates long term monitoring and management of staff health, and evaluate the benefits of Sunway Medical Centre health promoting interventions. This partnership between Monash University and the Sunway Medical Centre aims to lead to a number of projects that will be carried out, initially over a two-year period. The program is based on the concept of a small scale public health observatory. Observatories are designed to provide comprehensive and objective information that describe, analyzes and forecasts patterns, interrelationships processes and outcomes. It brings together existing information in order to analyze it for the purpose of addressing a range of research questions relevant to health and well-being of the staff of Sunway Medical Centre. The program also explore general trends in health and well-being as they relate to various social and work-related factors. It explores factors that relate to participation in various work place health promotion programs and to analyse more effectively, how successful these programs might be.